Sundays were made for slouchy Spring layers. And coffee. 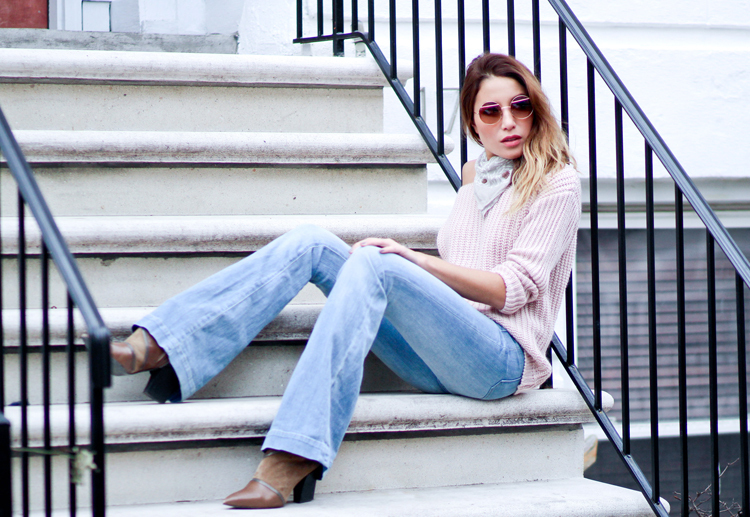 Through the High Low sweater c/o Tobi.com, Dittos flare jeans, Mina Perhonen scarf, ZeroUV sunnies, Charles David booties. Shot by Isaac Lacey. There's nothing like waking up on a Sunday morning to the sun shining through the window, soft light illuminating your bedroom as you listen to the noises of Brooklyn waking up around you. Buried deep in your crisp, cozy sheets, tucked in next to your man... right where you should be. Nowhere to be except maybe brunch in a few, but even that can wait because, what's the rush? Slipping into a cozy, oversized sweater when you're finally ready to get dressed, pants totally optional. And then there's that moment when take your first sip of hot coffee and he smiles at you and you can tell it's going to be a damn good day. Happy Sunday guys! 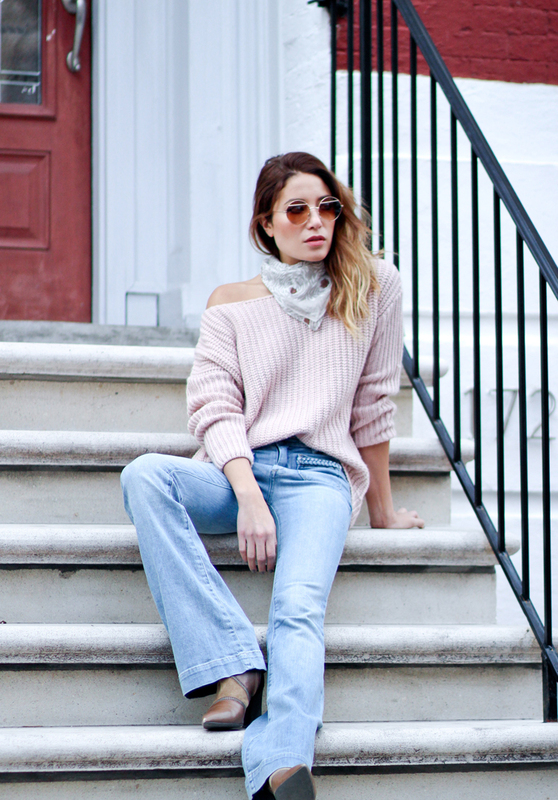 Love the sweater with the flare jeans and the scarf! Love the scarf and sweater combo. You look great. 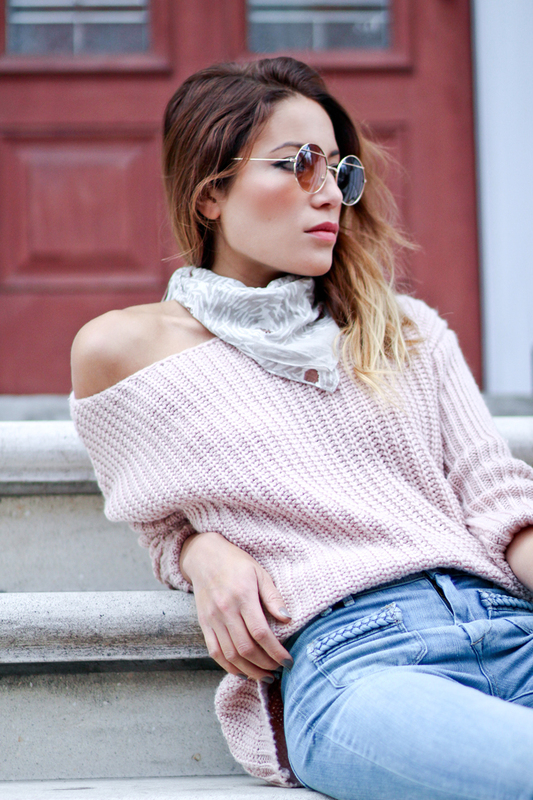 Such a chic combo, your blush sweater is perfect! Love the vibes. Love your Prose. You should take it out of the closet and wear it more often.